I interrupt the regularly scheduled fashion blogging to bring you an important human rights update. You will be seeing many more posts like this so long as Donald Trump continues to be an imminent danger. I cannot believe what I have been watching on TV. Yesterday, twelve people were detained at JFK International Airport in New York City and countless others were detained at airports around the country and the world. All this occurred just one day after Donald Trump issued an executive order banning all refugees for four months, all Syrian refugees, and immigrants from seven Muslim countries from entering the United States. To think at this time last year, I was volunteering at MIRA, the Massachusetts Immigrant and Refugee Advocacy Coalition, aiding in the completion of people's N400 application for U.S. citizenship. The contrast is dismayingly drastic. The N400 application is tedious, time-consuming, and stressful. It's 27 pages long and asks highly personal, difficult, and triggering questions pertaining to culture, nationality, terrorism, and other illegal activity. The standard applicants are held to is exceptionally stringent. As I assisted in the completion of these applications, I was so fortunate to hear the stories of individuals, many not much older than me with families of their own, who all shared a common goal: to have a better life in the United States of America. They applied for freedom, opportunity, success, and education. They had goals, dreams, and a vision of what their life could be like if they successfully completed the naturalization process. They were devoted to our nation and all it stands for. My heart breaks, as the values these incredible individuals hold so dearly are tearing at at seams of democracy. Lady Liberty is weeping. Prime Minister Justin Trudeau has tweeted that all are welcome in Canada. Last night, protests happened across in airports across the country, including right here in Boston at Boston Logan International Airport. The American Civil Liberties Union filed a lawsuit against the White House and issued a stay prohibiting detainees from being deported. This is a small victory. Today, more protests will be taking place in cities around the United States. Freedom must always ring, even when the powers that be try to mute its beckoning call. I will keep up the fight. Go Bitsy for interrupting fashion to talk about other important stuff. 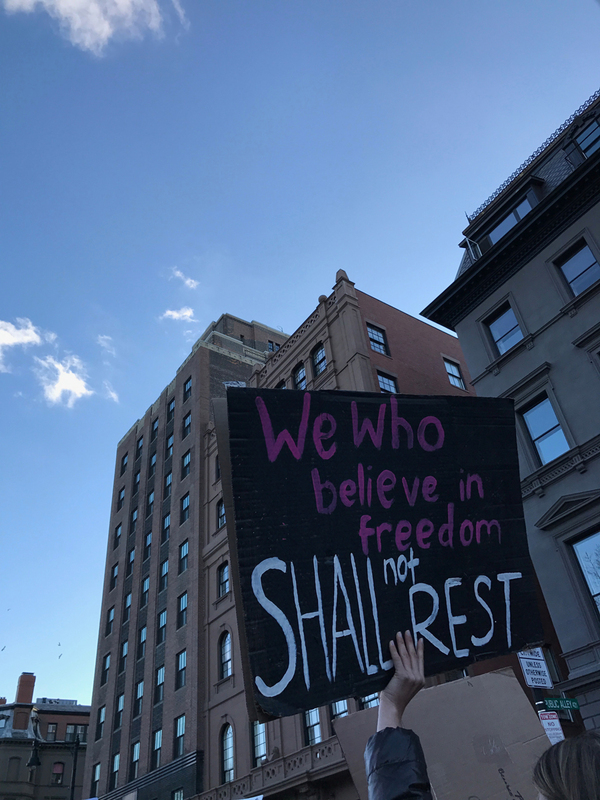 I saw that you were at the Boston March and I'm so happy you went! Thanks so much, Emma! I'm glad I was able to attend the march. It was incredibly powerful and empowering.